Save Yourself is an astonishing, fully-realized tale of two families struggling to communicate through layers of trauma, written with a steady, careful hand. Kelly Braffet isn’t afraid of dark places–Save Yourself goes deep into the hidden and shameful parts of grief, love, and anger, and the reader emerges shaken and grateful on the far end. It’s a lacerating read, and proves that Braffet is a writer in full command of her many, many talents. 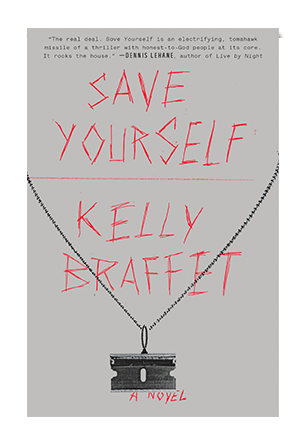 Kelly Braffet’s Save Yourself is that rare and beautiful thing—a novel that takes us to dark places not just through vivid storytelling but also through keen emotional force. It’s a tale of damaged families and the perilous weight of the past, and as the action rushes towards its chilling conclusion, you’ll find yourselves breathless, shaken, moved.